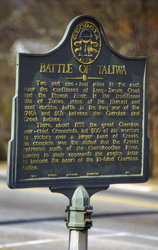 A marker in downtown Ball Ground, placed by the Georgia Historical Commission in 1953, states: “Two and one-half miles to the east, near the confluence of Long-Swamp Creek and the Etowah River, is the traditional site of Taliwa, scene of the fiercest and most decisive battle in the long war of the 1740’s and 50’s between the Cherokee and Creek Indians. 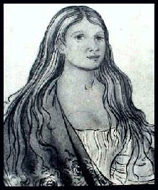 According to the history published on the Cherokee Nation website, Nancy Ward, who was born in 1738, accompanied her husband Kingfisher on a raid of the Creeks during the Battle of Taliwa in 1755. Kingfisher was killed in the battle, and she took his rifle and rallied the warriors to victory. Nanye-hi (“One Who Goes About”), known in English as Nancy Ward (c. 1738 – 1822 or 1824) was a Ghighau, or “Beloved Woman” of the Cherokee nation, which meant that she was allowed to sit in councils and to make the final decisions, along with the other Beloved Women, on any actions which the Cherokee nation were to take. She had been educated by Moravians, and believed in peaceful coexistence with white people. Ward was born in the Cherokee town of Chota, the daughter of Tame Deer and Fivekiller, who was part Leni Lenape. Her first husband was the Cherokee man Kingfisher. Nanye-hi and Kingfisher fought side by side at the Battle of Taliwa against the Creeks in 1755. When he was killed, she took up his rifle and led the Cherokee to victory. This was the action which, at the age of 18, gave her the title of i>Ghighua.